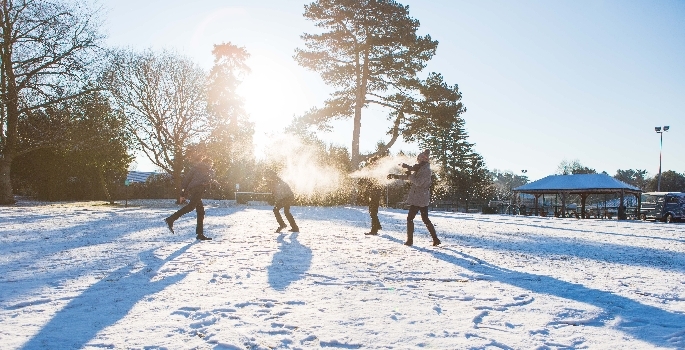 A leading independent school headteacher is encouraging parents to keep their children at home for snow days – to build special memories that are far more valuable than anything that can be learned at school. While the ‘Beast from the East’ is wreaking havoc across the country, Shaun Fenton of top-ranked independent Reigate Grammar School – which remains open to pupils – is advising parents to enjoy time with their children, playing in the snow, making snowmen and going sledging. “I believe that there are too few snow days for our children where they can go out and enjoy making snowmen and go sledging. Therefore, if there is a lot of snow and you can go sledging or make snowmen with your children today, then maybe today is a chance to make some special memories,” added Shaun. At the end of last term, when Reigate was almost alone in escaping the snowfalls that fell in the rest of the country, the school created its very own snow day by hiring industrial snow machines to transform the playground.